There is an inverse relationship between our ability to live and work remotely and the quality of the Internet connections from those remote locations. Every country has its metropolitan areas with dense population and 100Mbps fiber connectivity, and every country has its outlying areas with flaky Internet connections. It’s really difficult for any network-reliant company (and that’s pretty much everyone these days) in those areas to operate at the connection speeds required by most business processes. It’s similarly difficult for blue light emergency services or mobile health facilities that require unbreakable connections to operate out ‘in the sticks’. While there are several fixed and mobile service providers in rural areas, each of their services is too limited. Business customers need WAN access bonding to solve the problem. In the US, the 2016 FCC Broadband Progress Report finds that 39 percent of rural Americans (23 million people) lack access to 25 Mbps/3 Mbps fixed broadband. One such rural area is around Shreveport in Louisiana, USA. With a population of 200,000, the city is well provided with fast Internet connections. However, in the surrounding countryside, connectivity is much tougher. This has been a show-stopper for many initiatives in the mobile health field. Two mobile screening units suggested by Feist-Weiller Cancer Center’s Partners in Wellness program in 2015 could mitigate the barriers of cost and access for residents in need of routine health screenings. The mobile screening unit could provide mammograms, pap smears, prostate examinations, colorectal screening kits, and head and neck cancer screenings. The proposed mobile screening unit would have digital mammography equipment, an examination room, a waiting area and two dressing rooms for screening women, and prostate screenings for men. The vehicle has its own generator, and is fully wired throughout with AC/DC electricity and Internet connectivity. But, the unit needed high-speed connectivity for the remote diagnostics. Specifically, it would need a wireless link to the Rural Health Information Exchange Network, which links rural clinics and hospitals. This connection had to be good enough to permit physicians at Louisiana State University (LSU) Health Shreveport to consult and read mammograms in real-time. Most business locations can get a copper wire connection with ADSL services providing up to 25Mbps download and 2Mbps upload speeds. 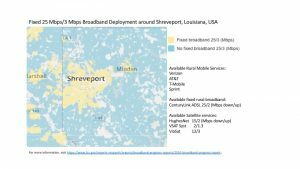 Around Shreveport they can also get a 3G, 4G or 4G LTE mobile phone services from Verizon, AT&T, T-Mobile or Sprint with connection speeds anywhere from 0-10Mbps. Available VSAT satellite systems can provide 1-3Mbps upload speeds. Individually, any of these service options is a far cry from the demands of a mobile clinic that needs to reliably send X-rays and 600MB 3D tomographic images back to the LSU university’s Picture Archiving and Communications (PAC) system. The competition between fixed and mobile services providers, the speedy evolution and deployment of faster mobile data connections and the plummeting per-megabyte pricing is providing a unique connectivity opportunity. But these different WAN access options need to be combined into a single logical connection. This is the mission that SD-WAN routers from vendors like CradlePoint, Velocloud and Peplink aim to solve. Their SD-WAN routers bond cellular connections as well as any fixed broadband connection from multiple providers, delivering maximum bandwidth and stability in areas where cellular coverage is poor. One mobile clinic vehicle was equipped with a MAX HD4 Quad 4G LTE Mobile Router with Peplink’s SpeedFusion bandwidth bonding. This bonds the bandwidths from all four available cellular providers into a single stream. Vehicle 2 got two MAX BR1s Routers with embedded US 3G/4G Modems, and a MAX HD2 with dual embedded cellular modems and bandwidth bonding, plus a built-in 4-port Gigabit Ethernet switch. This enables the vehicles to operate unbreakable VPN connections with LSU’s Balance 580 router in Shreveport. This router handles any combination of up to 13 DSL, cable, 4G LTE, and 3G links. In this configuration, it bonds the bandwidths of the 4 cellular connections allowing the vehicles to download very large files, access patient registration and databases, as well as seamlessly communicate using VoIP telephony. When there’s an opportunity to work in areas with Wi-Fi, the routers provide ‘Wi-Fi as WAN’. Set-ups similar to the Shreveport rural health links have been deployed by police and blue-light services operating in rural areas for high-speed mobile connectivity. It is also a great opportunity for many small businesses in rural areas to get up to speed, and thus close the competitive gap between centre and periphery locations. No longer does ‘out in the sticks’ have to entail flaky services, when it comes to network connectivity.